I made Spirit Book #13: Hope Offering in 1998 and it is still one of my, and my family's, favorites. It's one of the few I will not part with. The hawthorn twigs were sent to me from Oklahoma by artist Sunni Mercer who had taken Calligraphy 101 with me when she was studying at Rivier College (now University) in Nashua, NH. 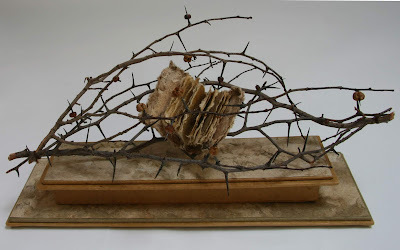 I tied them together with thread and placed horn beads and pods from the herb rue on some of the thorns. 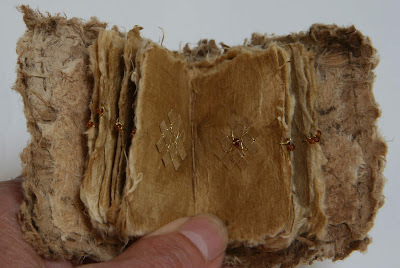 Nestled inside is a book made from Lokta and amate paper with woven paper strip designs in the center with gold metallic thread and beads. The hawthorn is a symbol of hope. In Ireland and Wales, women hang bits of cloth on branches near sacred wells, a custom that was originally an offering to the goddess. The hawthorn cradle is embellished with beads and seed pods from rue which is the symbol of all good things at weddings in Lithuania.